Seahawke is the ultimate floating home. Forget waterfront houses, this huge houseboat gives you 360 degree water views! The panoramic waist-to-ceiling windows mean you get the view when you are standing in the huge kitchen, sitting at the large dining table or even laying in the beds. When you want some privacy the exterior window covers stop the suns rays and stops others looking in while still allowing you to see out to the veiw. The interior of Seahawke feels more like a high end apartment than a boat, and comes fully furnished so all you have to do is move in and unpack. The chef's kitchen is decked out with Westinghouse appliances and two large fridges, and has enough space to prepare gormet meals for all your family and guests. Both bathrooms have full sized seperate showers fed with instant hot water systems so you never have to face a cold shower. The open-plan layout has all of the main living spaces on a single floor, which makes getting around very easy. The stairs to the upper deck are wide and very easy to climb, even for small dogs. Upstairs you will find the huge deck space with enough room for several tables and a potted plant garden. There is also a fully enclosed flybridge which can be used as additional accomdation, an entertaining area, or a fantastic kids play room to give them their own space and the adults some valuable peice and quiet. Powered by two 90hp Suzuki outboards she is manuverable enough to navigate any waterway you wish to explore. The solar panels and silent wind generator will keep your batteries topped up and the huge fresh water and fuel tanks are built for extended adventures. The helm station located on the lower level at the very front of the boat gives a great view of the anchor and makes picking up moorings so easy. The boat has wide walk-around sides giving excellent access to the whole boat, and make catching the lines of visiting dinghys a breeze. The outboards lift completely free of the water so there is no marine growth to contend with, and they are covered with custom wooden covers so you can walk over them or use them as additional seating on the back deck. The roof of the back deck is motorised so you can control the ammount of sunlight with the push of a button while you sip your champagne and admire the sunset in complete comfort. This really is the ultimate home on the water, or weekend family escape. Call Tony on 0424 842 222 or Sean on 0468 601 210 to find out how she can be yours! Two double berths at the bow, double bunk cabin, two full sized bathrooms. Muir Anchor winch with 40m of chain. 8x 1100Ah batteries, Outback inverter/ battery charger, Silentwind wind generator, 16x 90watt solar panels, Electric opening pergola roof. Licenced to carry 20 people, antifouled in May 2018, and fully funrished Seahawke is ready to become your new home, or summer retreat. 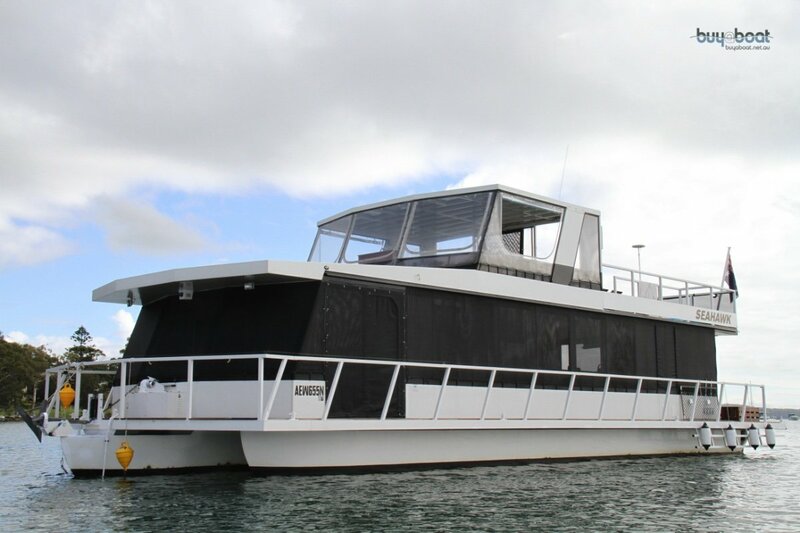 Call Tony on 0424842222 or Sean on 0468601210 to view this great houseboat and pickup your ticket to your new lifestyle on the water!